Sgt. 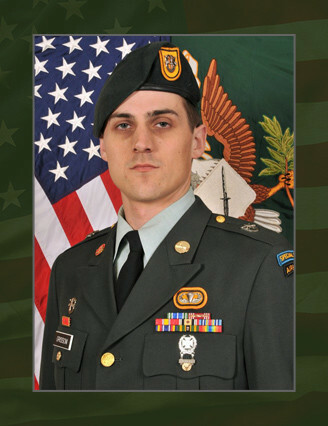 1st Class James F. Grissom, 31, of Hayward, Calif. died March 21, 2013 at Landstuhl Regional Medical Center, Germany, of injuries sustained from small arms fire on March 18 in Paktika Province, Afghanistan. Grissom was assigned to Company A, 4th Battalion, 1st Special Forces Group (Airborne), Joint Base Lewis-McChord, Wash., and was deployed in support of Operation Enduring Freedom-Afghanistan. This was Grissom’s fifth deployment to an Overseas Contingency Operation. Grissom graduated from Mt. Eden High School in 1999 and attended college at the Art Institute of San Francisco, earning his Associate’s Degree in Computer Animation. He enlisted in the Army in June, 2003, under the 18X Special Forces Enlistment Program. After graduating from the Special Forces Qualification Course in October, 2005, Grissom was assigned to 2nd Battalion., 1st SFG (A) JBLM. During his time with 2nd Battalion, Grissom deployed on several JCETs (Joint Combined Exchange Training), and deployed to Iraq in 2009. Grissom was re-assigned to 4th Battalion in Nov. 2010 as an engineer sergeant and deployed to Afghanistan in support of Operation Enduring Freedom-Afghanistan in 2012. Grissom’s military education includes the Special Forces Qualification Course, Warrior Leader Course, Advanced Leader Course, Survival, Evasion, Resistance, and Escape (SERE) Course, the Special Forces Advanced Reconnaissance, Target Analysis, and Exploitation Techniques Course, and the Basic Airborne Course. His awards and decorations include the Army Commendation Medal, two Army Good Conduct Medals, the National Defense Service Medal, the Iraq Campaign Medal, the Afghan Campaign Medal, Global War on Terrorism Service Medal, Global War on Terrorism Expeditionary Medal, Overseas Service Ribbon, two Non-commissioned Officer Professional Development Ribbons, Army Service Ribbon, Special Forces Tab, Combat Infantryman Badge, and the Parachutist Badge. He was posthumously awarded the Bronze star Medal and the Purple Heart. He is survived by his wife, parents and his sister.